Convenient. Easy on the wallet. Possible even from the comfort of your home. We’re talking staycations, and the best ones to experience without leaving home are those spent in the swimming pool. Create Shangri-La in your backyard with a dramatic stone grotto. Built using real or faux materials, these cave-like structures typically incorporate a large, towering waterfall. When you want to escape—without leaving home, a grotto offers a miniature sanctuary. In the shaded cove beneath the falls, couples can get romantic, swimmers can get a break from the sun’s rays, or the kids can pretend they are guarding a fort. 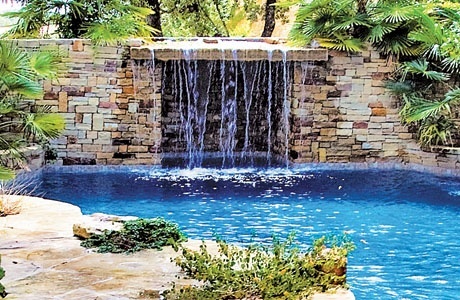 Along with enhancing the overall appearance of your pool, a spa brings another dimension to functionality—and fun: Use it in several ways for your staycation. Host a hot tub party for your friends. Or, relish some solitude and unwind. Relax away stress by indulging in warm waters and relieving sore muscles with massaging jets. For another form of escape: Play some music as the sun goes down, and it’s an intimate backdrop for you and your partner. Best of all, because the spa water heats independently of your pool, you will also extend “swim season,” making it possible to take an aquatic staycation during additional months each year. For many, no staycation would be complete without lounging in the sunshine. And it’s even better if you have a tanning ledge in your pool. Also referred to as a “Baja bench” or “tanning shelf,” these shallow perches provide a spot to set your lounge chair or for you to lie partially submerged in the cool water. As for design, this ledge can be built with the same interior finish as the rest of the pool for a uniform, blended look. Or, it can be covered in a distinctive material—typically flagstone—that visually distinguishes it from the rest of the pool. Remember having drinks at the great swim-up bar while staying at a tropical or beach hotel (or seeing photos of one at your dream destination)? You can have that kind of amenity right at home! 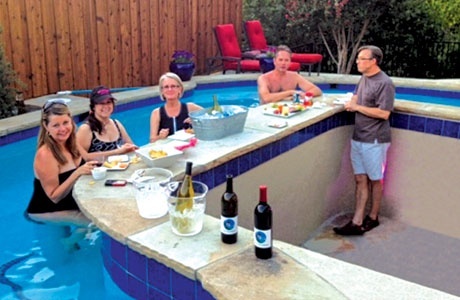 A swim-up bar is similar in concept to a regular kitchen that boasts a bar top with a set of bar stools on the exterior. For the pool version, your builder will integrate three to six bar stools into the floor in the shallow area. A section of the pool perimeter will be constructed like a bar top, and immediately adjacent will be a bar where you can play host serving up drinks. 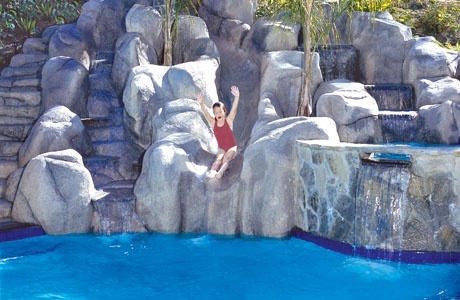 Capture a bit of the excitement your kids might have at a water park. Now, we know that a slide at your pool at home can’t compare to one at a commercial facility; however, it can certainly offer some of the fun—and without the long lines, admission cost, pricey food, public-changing rooms, and exposure to heavily chlorinated water that’s had hundreds of bodies swimming in it! A wide array of slide models are available. Choose from various heights and styles, including different kinds of ramp curves such as a corkscrew. You can also pick colors to coordinate with other materials used in your pool and decking. For a more upscale design, ask your pool designer to blend your slide into faux or custom rockwork like the elaborate one shown here, or, in a more modest configuration. Take poolside table and seating inside the water. Your pool builder can include a cocktail table and built-in seating along the shallow end of your pool. Depending on the style you choose, this upgrade can be an affordable way to expand the versatility of your pool for drinks and dining. For added comfort, include a table with an insert for a big umbrella. You and your friends and family will have it made in the shade while enjoying cocktails or a meal in your home-version of a vacation-style setting. A real vacation means tranquil evenings too. 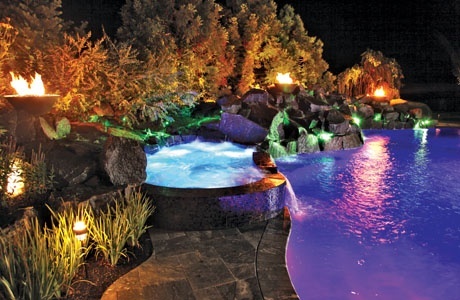 After the sun goes down, an advanced LED lighting system can extend your “poolcation” for hours. With LEDs, you elevate poolside ambiance to dazzling levels with color-changing illumination around your pool, spa, and landscaping. Adjust colors with an easy remote, and push a button to play an assortment of pre-programmed “light shows.” These choreographed, color-theme shows like “USA” or “Mardi Gras” may not be a match for Las Vegas, but they will deliver a stunning display of intense, jewel-tone colors that make you feel like you are somewhere else.